On Monday I found myself driving out to The Glen on the NSW Central Coast on what turned out to be a very dreary July day. Despite the bitter wind and drizzling rain, after stepping out of the car it didn’t take long to feel the warmth that makes this place so special. The Glen is an award‐winning male drug and alcohol rehabilitation centre on the Central Coast. The Glen works with some of the most vulnerable Australians who have fallen through the cracks of society, with over 30% of the centre’s clients referred from the criminal justice system. The men who come through the gates have each walked a different journey, but are all met with love, with respect and without judgement. The Glen’s program is a holistic approach to rehabilitation, incorporating physical, mental and spiritual well-being. However, staff tell us it is the spiritual self that can be the hardest to heal. This is where reconnecting with nature, with culture, with community and with family is so vital. It is clear from the pride and warmth with which the staff talk about the residents, that during their time at The Glen the staff and clients grow to become a family. However, when clients complete the program, re‐adjusting to their own family life can be difficult and overwhelming. Families therefore play a critical role in a client’s recovery. The Glen Family Program, supported by Mary MacKillop Today, is a new initiative that helps to build the confidence and skills of these men to be good role models, fathers, brothers, and uncles. 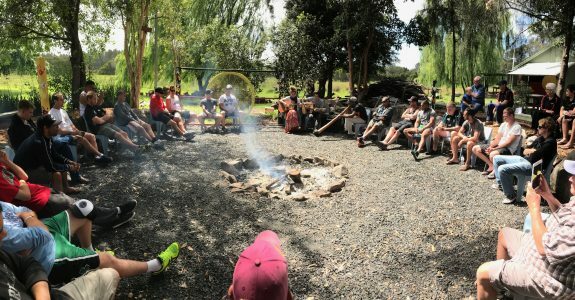 The project aims to bring the families of these men along on their journey, to provide opportunities for healing and to help to ensure their transition out of The Glen can be supported and sustained. This work, alongside a School Outreach project which was launched with funding from Mary MacKillop in 2016, demonstrates The Glen’s commitment to broader community benefit. Significantly, both programs contribute to providing the next generation with positive role models, breaking the cycle of substance dependency in at-risk communities. What was particularly impressive to see was the focus on prevention, and the commitment of staff to eventually ‘put themselves out of a job.’ Programs like those instigated by The Glen and supported by Mary MacKillop Today in regional high schools and with families are so crucial in providing hope for a positive future for kids in regional communities. It is clear that the love and warmth of this incredible group of people is being felt by many. Read more about our Small Community Grants and our projects in Australia.